Encourage Your Children to Read and Pray…Every Day! Kids can discover God’s Word for themselves while building a foundation of Bible truths that will stay with them forever! This just-for-kids daily Bible provides the perfect trio of engaging, easy-to-understand narrative; delightfully detailed illustrations; and personal prayers that draw a child closer to the heart of God. 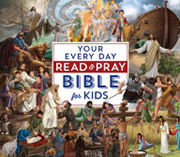 Ideal for read-aloud time and fun for beginning readers, these 365 selections of best-loved Bible stories teach good devotional habits from an early age. Young readers will love looking at the pictures and experiencing favorite Bible stories at their own level while planting the seeds of God’s truth in their hearts. Kids will learn directly from the Bible what God says about His creation, showing kindness to others, trusting in the Lord, following God even when it’s hard, being thankful in all circumstances, hearing God’s voice, and praising and worshiping their heavenly Father.